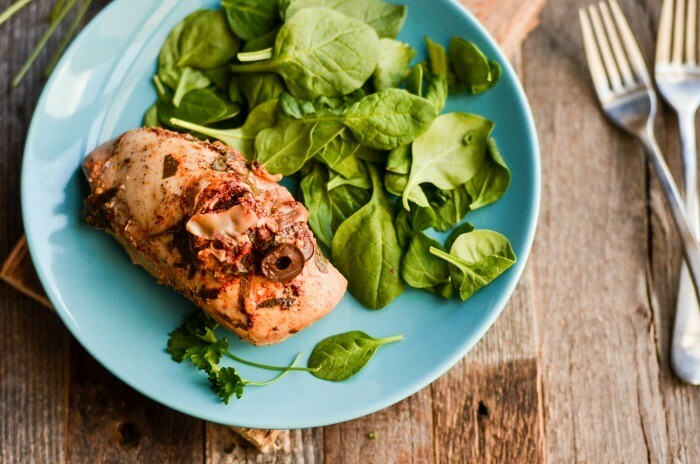 Crock Pot Greek Stuffed Chicken is beautiful, healthy, and delicious! Combine spinach, olives, peppers, artichoke hearts, feta, oregano, and garlic powder in a bowl and set aside. Pour the chicken broth in the bottom of the slow cooker. With a small, sharp knife make a deep cut in the chicken breasts to create a pocket. This can be either in the center, or in the middle of the thick side. Be careful not to cut through the chicken. Season chicken breast well with salt and pepper. Stuff the chicken breasts with the mixture from the bowl. Add stuffed chicken to a 6 or 6.5 quart slow cooker. The cut side should be facing up so the filling doesn't fall out. Your slow cooker will be pretty full, which will help keep the chicken upright. Cook on LOW for 4 to 5 hours, or until chicken is fully cooked. If desired, reduce remaining liquid by straining it into a saucepan and simmering until thickened. Drizzle reduced sauce over chicken before serving.